Loved this hotel...after reading some reviews was a little bit scared about going there, but there is no need. Its excellent. Typical Majorcan style, very quaint, and not too commercial. All rooms are now air-conditioned, have balconies overlooking the pools. Food & Pool were excellent, rooms are basic , most without air-con! Not many English but everyone was friendly. This was August so be down to the pool by 8.30am if you want a sunbed & a good spot.Overall kids loved it & for all-inclusive couldn't really fault it.Would go again. Very clean hotel, with two good pools. The hotel caters for a variety of nationalities, which added to the experience as all were very friendly and now my Kids have loads of new international MSN friends! The food was reasonable with 5-7 different choices at each meal time, It was produce en masse and a bit 'School dinnerish' . we did get rather bored with the menu and ate out a few times to break up the monotony. Hotel in cala egos which is quiter than cala dor but has a few bars and restuarants and shops. Cala dor approx 25 mins walk or a 6 euro taxi ride. Staff were excellent spoke all languages and were helpful. Entertainment was varied, during the day there was a kids club and numerous sporting activities and a night an evening show/ activity. The evening activities were quite basic (ie Bingo/ Quiz or show put on by entertainment team and could have been better) Kids disco at 9-9.30 then 10-11.30 the hotels entertainers. All a bit late really and quite boring as introductions were done in 4-5 languages!! The only real negative was that some rooms dont have air con and if its really hot its unbearable. We had to buy a fan as the hotel doesnt rent. We booked last min for a 7 night stay. And the only slight fault we could find after reading many bad reports was the small plastic cups and room air con could be better. It was a great holiday from the start. We were escorted to our very clean room. The food was more than we expected for a 3 star hotel the was something for everyone at the international buffet breakfast, lunch and dinner. If you are a really fussy eater then the bar snacks were served from 10am-11pm (hotogs, burgers, fish fingers, chips ect) there was afternoon tea where gorgeous cakes were served for 1hr. 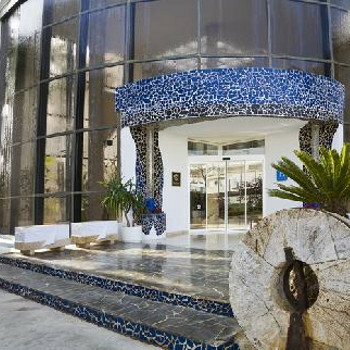 The Hotel is in a quiet location approx 1km from Cala D'or. The rooms were pleasant, all with pool views with the bed linen and towels being changed daily. The swimming pool and surrounding area was lovely with the pool side bar serving excellent and reasonably priced food. Our only compliant was the food which was awful and repetitive, we even struggled to find something appetising for breakfast! We had fantastic weather and most nights went on the train, which stops right outside the hotel, into Cala D'or or the Marina. Accommodation very basic, however, clean. OK for couple with small child, however, too small for families of three and above. Towels and sheets changed daily. Pool area lovely, large and clean. No life guards which caused me a bit of concern as there is only a very small shallow area dedicated to children, the rest of the pool declines rapidly. Entertainment team worked very hard and were very good with the children. Although they could all speak English, there were no british members in the team. Very few british people in the hotel at all. Food was absolutely disgusting which would make me not want to go back. Hotel not within walking distance to Cala D'or, but able to walk to Cala Egos which had a few good restaurants and bars. Train stopped outside, but sometimes was full by the time it got to our hotel. Room to small and no airconditioning. No fans available to rent. Budget brochure described beach as small, should have said 100m wide and shared by two hotels. Hotel staff were not friendly or helpful. Excellent pool area but no lifeguard. Entertainment staff tried very hard. Night bar staff ok.
Will not recommend this hotel or Budget travel ever. Budget rep had difficulty in answering the mobile.